Grafted tomatoes are produced when two tomato plants joined together. Tomatoes from grafts have been regularly produced in European and Asian greenhouses. Their popularity in the U.S. is on the rise. As a bonus advantage, these tomatoes have bigger fruit and increased yield. Less stress and fewer diseases make it easier for nutrient uptake in plants so they can concentrate their energy on production. One tomato’s roots are used and another tomato’s body is used for the graft. Stock (or rootstock): the below-ground part of the tomato plant, used in a graft for its roots. This variety is chosen for the graft because of its resistance to fungal, bacterial, viral, and nematode pathogens, such as those pesky diseases like early blight, late blight, Septoria leaf spot, verticillium wilt, fusarium wilt, and bacterial wilt. Hybrid tomatoes are often the rootstock of choice since they have been bred for significant disease resistance. Scion: the above-ground part of the tomato plant, used in a graft for its stems, leaves, blossoms, and fruit. This variety is chosen for the graft because of its fruit qualities. Heirlooms are a favorite scion, especially for gardeners who have a passion for a particular heirloom’s taste. Tube grafting (or Japanese top-grafting): a fairly new technique that produces large numbers of plants quickly. Seedling rootstock and scion are severed and reattached with a clip during healing. Cleft grafting: a V-shape in rootstock and wedge-shaped in the scion are held together with a clip during healing. Approach grafting: notches on two stems held together with a clip during healing. Micrografting: a new technique used primarily with hybrid tomatoes. Very tiny scions are grafted onto 3-week-old rootstock. 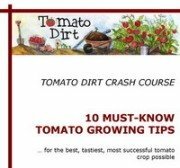 Several vendors offer grafted tomato plants. Check out different varieties here.